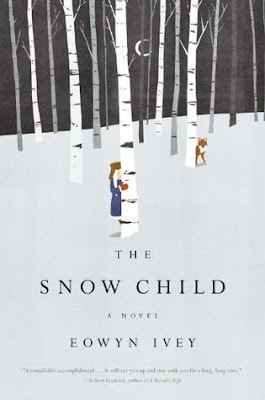 I was always attracted to the cover of The Snow Child, but it was Beth's review that left me really curious about this wintery tale. I ended up buying a copy with a gift card I received for my birthday earlier this year, but I decided to save it for cooler weather. I don't always have to match my read to the season, but I knew this had a more somber, melancholy tone. I thought that it would be much more fitting to read it in the fall/winter than in the spring/summer. The Snow Child is the story of Jack and Mabel, an aging and childless couple that moves to Alaska in hopes of building a homestead. The couple feels alone in their childlessness, and going somewhere far removed from society, friends and family offers a welcome respite. But instead of drawing them closer, the harsh landscape and isolating environment just highlights the tension in their relationship. They do still manage to have moments of joy. In one, a snowball fight leads them to build a little snowgirl. It's a decision that changes their lives forever. They wake up the next morning to find that the snowgirl is gone, but there's a real little girl who appears out of the woods. Faina, the snow child, quickly becomes a huge part of their lives. She's a little girl alone in the wild, fending for herself, and her origin and family are a source of mystery. Where does she come from? And where does she go each spring? Ivey was inspired to write this story after she read the classic Russian fairy tale of the snow maiden. Her website notes: "The story haunted Eowyn with its loneliness and magic in a landscape so similar to the one she grew up in. She spent the next few months researching the original tale, and depictions of it in Russian art work, before she began writing." I wanted to include that information because this book has a very magical, fairy tale quality to it. I spent much of the book wondering what was real and what was imagined. One thing that's very real, however, is Ivey's depiction of the Alaskan wilderness. Ivey lives in Alaska, and you can see her familiarity with the landscape and her love for it on every page. Even when it you see that this place is so brutal and unforgiving, it still seems like a beautiful place. From the sly fox to the cold winter wind, the setting is a HUGE part of this story. I could totally picture this place, and it made me really glad that I decided to read it during this season. The Snow Child is a very quiet, slow-moving story. It's not driven by any major action. Faina appears and disappears. She seems both real and make believe. I was so intrigued by this story, and I was left with so many questions and thoughts at the end. This is the kind of book I'd love to discuss with someone else! There may not be a lot of action, but the book could still spark a number of conversations. Ivey melds reality and fantasy in a way that felt so unique and so creative. Stories like this don't always appeal to me, but the setting and prose ended up winning me over. For all its magic, The Snow Child is still a very sad read. As I noted in the beginning of my review, there is a melancholy tone that hangs over this whole story. Mabel's sadness and Jack's loneliness is heartbreaking. There are so many unspoken thoughts and emotions - you can feel the wedge that's been driven between the two. It's definitely not a happy read, but I still enjoyed it. I can see why The Snow Child has garnered so much praise. It's a really haunting read - I've thought about the characters and the ending several times since I closed that last page. 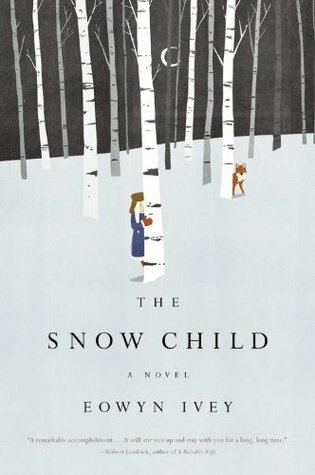 The Snow Child was so different from what I typically read, but I think it was a great addition to my personal library. This was such a strong debut, and it's a story that will lead to a different reaction with every reader. "We are allowed to do that, are we not Mabel? To invent our own endings and choose joy over sorrow?" This book sounds... evocative. That's the first word that comes to mind, based on your review and the summary. I think it would be a great read for the season we're in! I've seen it before, but never actually read a review for it, so it was great to hear your thoughts. I might just have to check it out! Yes, it's totally a winter read! It would be PERFECT to read right now. Haha I love it! I could totally see this book being very discussable - perfect for a book club! I've had this one FOREVER and still haven't read it. I've heard so many wonderful things about it and I love Alaska, so what's holding me back? I'll have to bump this one up in my list! Sounds goood. Really goood. I like the quote you included too. Yes, it's very good! I think you'd enjoy. A slower book, but definitely a lovely story. Ah, I've seen this cover around too and I had NO idea what it was about. It sounds incredible and I feel like Magan would enjoy this one too? I will send her this review. I don't think I've read anything set in Alaska before, and even your review has this fairy tale quality to it. Must put this on my list. Thanks for the recommendation, H! Thanks E! I'm so glad I got to put this book more on your radar. It's such a lovely, evocative read. It would be a great winter big kid read *hint hint* Haha! Like you, I received this book earlier in the year but haven't read it yet because I wanted it to be more weather-appropriate. I'm still going to wait to read this until it's snowy and in the middle of winter here by me. The main reason that this story has intrigued me is because of its connections to the Russian fairy tale. I know basically nothing about Russian folklore, but anything related to a fairy tale will immediately catch my attention. Thanks for pointing out the somber tone though - that's something I'll have to keep in mind. Glad you enjoyed this one overall, Hannah!